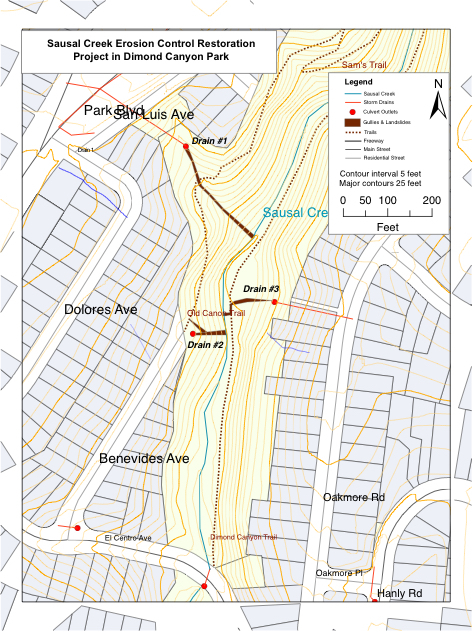 The Upper Sausal Creek Erosion Control Restoration Project (Project) is located about 2,000 feet upstream of the Sausal Creek crossing with El Centro Avenue, off of Park Boulevard. Work is scheduled to begin in July 2018 and will be completed by December 2018. For more information on the Sausal Creek Restoration Project, please visit www.sausalcreek.org/usrp-dimond-canyon-project, or contact Ben Livsey at (510) 238-6815 or blivsey@oaklandca.gov. The Project is being conducted to repair three gullies that were created by stormwater runoff from Park Boulevard. 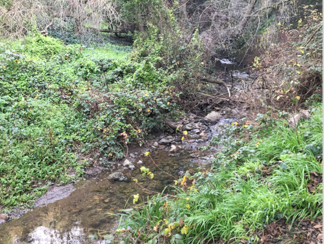 The gullies are eroding and contributing large amounts of sediment to Sausal Creek that impacts water quality and the habitat of the native Rainbow Trout that live in the creek. Project components include slope and gullies stabilization using a combination of biodegradable erosion control fabrics, intensive revegetation, and energy dissipating rock. Constructed swales will allow for increased stormwater infiltration and enhancement of water quality by removing some pollutants from stormwater via contact with vegetation in the stabilized drainage channels. The Project will reduce sediment input, enhance hillslope and creekbank stability, improve habitat for fish and wildlife, and provide recreational benefits. The Project is a partnership with the Friends of Sausal Creek who will organize volunteers to install over 3,000 local native plants in the project that have been grown in their nursery. 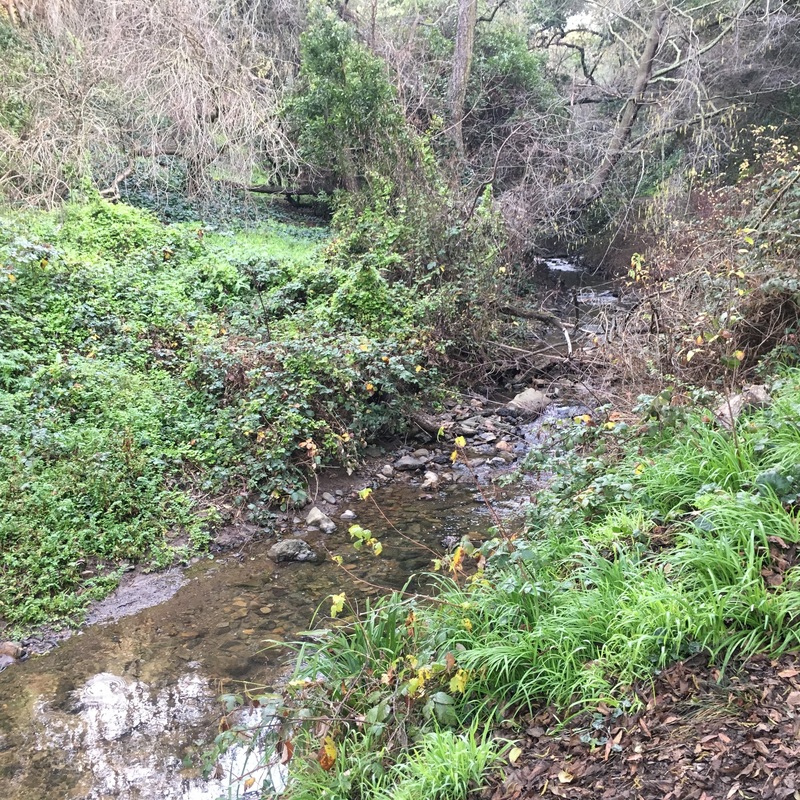 Sausal Creek in 2018 prior to Project construction. A large oak tree stump with root ball will be placed in the creekbank at this location to minimize erosion and enhance habitat for native Rainbow Trout. Photo of Drain 1 to be repaired (taken in 2013). 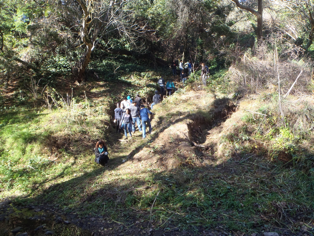 At the time, volunteers from Friends of Sausal Creek were clearing the gully for measurements and preparing the site for planting for temporary stabilization support. Notifications about the Project including public meetings, a project site tour, and other informational materials were presented or distributed at the following events and locations by the City and Friends of Sausal Creek.